In a world with ever changing values and technology, some things remain the same. Kinship, old mountain towns, and summer lakes. Most of the time you can depend on all three. Family is family. Most of us are connected if not by blood, in some other fashion to each other no more than 3 times removed. We connected to Joe, owner of this small town bar & grill and a new eatery called the Galloping Goose Cafe while in Rico, Colorado. He is a visionary for this town. Not sure if I could go back 4 decades, but the brief week we had in the old mountain town cabin took Dean and I to the simplicity of our childhood years. And we loved it. In search for WiFi a couple of times to get connected to our urban civilization to post photos and reserve a hotel room for our travels back home, other than that we lived without any electronics and screens. Dean and I resorted to reading, writing, napping, cooking, bird watching, photography, and walks. We return to our full-time employment with government entities that overwhelm with procedures, projects, policies, and politics. Cannot escape it in the evening with the political conventions being aired. So here is to wonderful July 2016 memories with family in the old mountain town and near the summer lake. I will keep reading, writing, … making more memories and connections. 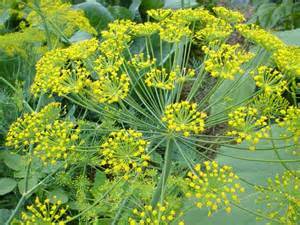 Our dill is daintily charming, and so fragrant. Yesterday evening we harvest our 1st crop, and will put in a 2nd crop after the 4th of July holiday. Wild sunflowers and sprigs of dill fill a green vase today. Our chef son-in-law will use this 1st crop of dill to make pickles with his homegrown cucumbers. Maybe a jar or two of Hannahway Farm sun pickles are on our way?! The patriarch spice shoppe owner says in Europe dill is used in just about every dish. I love it with my baked fish and potato salad dishes. The 3rd crop of dill will go in early autumn, with plans to take as show-n-tell farm products to the City of St. Charles preschool classrooms Farmer Dean and I visit in November. Our 1st crop of basil screams pesto! Served with veggies, chicken, bread, and pasta, I cannot wait! This week’s other farm chores include straightening and cleaning the screenhouse, putting extra pots and trays together in somewhat orderly fashion, and throwing broken items in the recycle pile. One recycled dresser is filled with “tea room” stuff, as well as a recycled tile-top table put aside for our meal and snack times. Another recycled dresser holds pots of blooming geraniums. We are making space in the screenhouse in case we need to move our plants to this cooler side of the greenhouse structure. Last year at this time the heat wave and drought was well underway in Missouri. The extreme heat required us to water two times a day, early morning and early evening. Our plants were housed under the shelter of shade trees in our yard while the greenhouse reconstruction plans were being modified until autumn when the heat subsided. The lack of rain has not been an issue this spring and early summer, thank you God! The growing gourd plants will go into the ground this weekend. Growers, what are you harvesting now? What are you putting in for an autumn crop? I am thankful for my husband Dean, also known as Santa Claus. It is his 52nd birthday today! As energetic today as he was in his youth, I am sure! 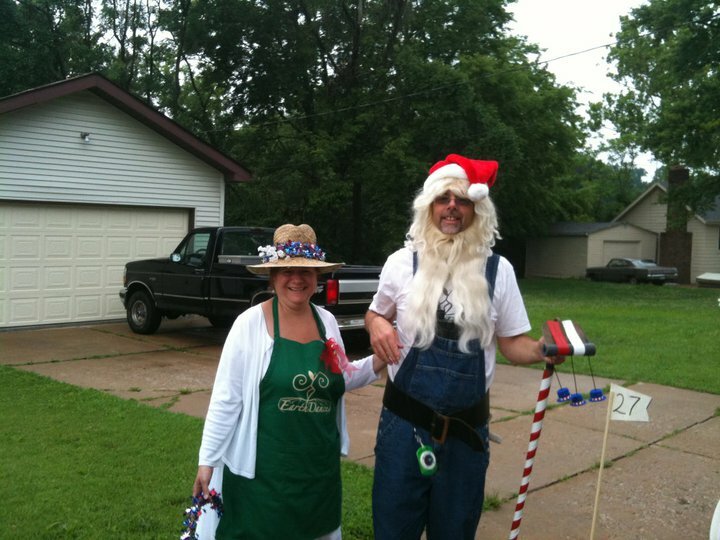 Photo taken at the 4th of July parade in Ferguson, MO in 2011 with the EarthDance Farm folks, Christmas in July theme.